Addicted to LOST's "Teaching Moments"
One might be forgiven for thinking there couldn’t possibly be much science in a TV show about castaways, but one would be mistaken. There is aerodynamics in the plane crash, for instance, as well as meteorology, oceanography, and makeshift medicine as the lone doctor among the survivors tries to keep everyone healthy. And the main story arc of Season 5 relies heavily on the physics of time travel. Hence the request to provide theoretical physicists for a bonus feature exploring the real-world physics behind the science fiction. But the producers went one step further: the Blu-Ray edition of LOST Season 5 will feature a fictional “LOST University:” an interactive bonus feature wherein “students” can learn not just about general relativity and time travel, but also explore the ABCs of Egyptian hieroglyphics, gain a smattering of French and Korean (two languages featured on the series), and delve into the history of philosophy. The cast and crew will walk users through basic jungle survival skills, and actor Jeremy Davies, who plays physicist Daniel Faraday on the show, will host a special segment on his favorite topics in physics. There are many ways this can be accomplished. For instance, when Watchmen was released earlier this year, physicist Jim Kakalios – the film’s technical consultant and author of The Physics of Superheroes – released a YouTube video incorporating footage from the film into his discussion of the physics concepts that might be behind Dr. Manhattan’s superhuman powers. It’s been viewed over 1.5 million times – and still counting. Another TV series, Numb3rs, partnered with Wolfram Research on a Website providing more in-depth information about the physics and mathematics featured on each episode. DVD extras provide another prime opportunity to talk about the underlying real-world science behind the fiction. We were thrilled to work with the producers of the LOST bonus features – and equally thrilled to provide scientists for the DVD extras for Season 1 of Fringe. (Both will be released this fall.) 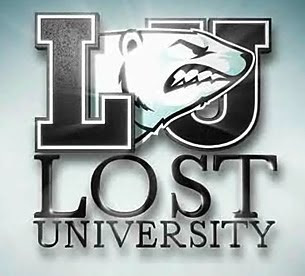 LOST University takes things to the next level, exploiting the capabilities of new media like Blu-Ray and interactive online games to engage viewers beyond the weekly episodes. Talking about time travel in the context of their favorite show is a great way to make physics accessible to a broader audience. The idea seems to be catching on. Computer science professor Luis von Ahn – the man who invented Captcha to weed out SPAM bots from blog comment threads – recently proposed that university professors might consider producing “Hollywood style lectures”: videotaped lectures done on a big-budget scale, with high-quality production values. “Instead of my amateurish attempts at making good lectures that fail most of the time, and instead of repeating the same thing every semester like a broken record, why don’t I just produce really good video lectures?” he ponders. It makes sense for science to be included in the mix as TV in particular begins to move online, and make use of interactive multimedia – particularly since so many nowadays have a great deal of scientific content. It’s good for the viewers, it’s good for the studios, and it’s good for science. Everyone wins! I, for one, am excited to see how this tremendous potential resource develops. ‹ The Zombies Are Coming!